Many people love to enjoy music while driving their motorcycle. In order to make it safer for such people, Bluetooth headsets with various types of speakers are available in the market these days. Some of the bike companies have also included Bluetooth speakers with their latest models to make it convenient for the riders. You may not like speakers on your motorcycle but they are necessary if you love to listen to your favorite tracks while riding. You may not be able to hear the music of your choice while wearing a full face covering helmet or driving at highway speed due to wind noise. Bluetooth speakers will allow you to enjoy your favorite music while on road or at traffic lights without telling others about it. The information provided in this write-up will help you to find the best Bluetooth motorcycle speakers for your personal use. How to choose the best Bluetooth speakers? Motorcyclists should use wireless speakers to avail a number of benefits given hereunder. Boss has introduced one of its best speakers in four styles including speakers with a black finish with and without Bluetooth and with the silver finish with or without Bluetooth to choose as per your own liking. You can use Bluetooth for streaming audio files wirelessly. 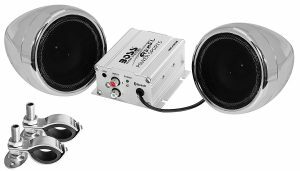 These high power speakers include weatherproof amplifier and 2 channel amplifier to provide high-class performance. It can be compatible with all types of smart devices through its 3.5mm Aux-input feature. It can be used ideally with ATVs, motorcycles, scooters and UTVs with a 12-volt battery. Its package includes two chrome 3” speakers, one in-line volume control, adjustable brackets to fit on handlebars and a 2 channel Bluetooth amplifier. 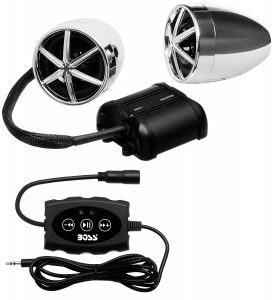 These wireless motorcycle speakers from Boss are available in silver and black color variants to choose from. Through its remote control system, you can use it for wireless streaming of audio files. 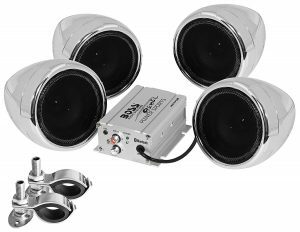 This speaker is powered by 4 high performance and compact weatherproof amplifier channels. It can be used ideally with the applications with 12 volt battery like motorcycle, scooters, UTVs and ATVs etc. Its 3.5 mm built-in Aux input is compatible with the output of iPhone/iPod, MP3 players, and Smartphone. Its package includes a 4 channel Bluetooth amplifier, 4 chrome speakers of 3-inch size, adjustable brackets for handlebars and an online volume control system. This Bluetooth speaker from Boss is available in two models – 2-speaker model and 4-speaker model in silver and black color variants to choose from as per your preferences. Its wireless remote control can be used for wireless streaming of audios. These speakers with 3.5 mm Aux-in are powered by compact and high performance 2 Channel and weatherproof Bluetooth Amplifier. They can also be used perfectly as Bluetooth motorcycle handlebar speakers on various types of vehicles including UTVs, ATVs, scooters, and motorcycles to provide you the music of your choice with the help of its 2 channel amplifier, two 3” chrome speakers, adjustable brackets to hold handlebars and Bluetooth multi-functional controls while riding. This speaker has been introduced by Sound Storm Laboratories in chrome and black finish to choose from as per your suitability. These motorcycle handlebar speakers and amp can also stream music wirelessly through its Bluetooth amplifier. 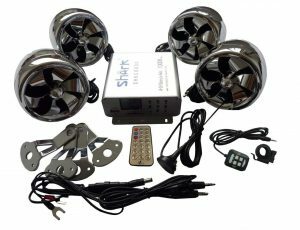 This speaker can be used with applications having 12 volt battery like ATVs, UTVs, motorcycles, and scooters. It is provided with weatherproof high performance 4 channel Bluetooth amplifier, 3.5 mm Aux-In, inline volume control, 4 speakers of 4-inch size and adjustable bracket to fix it on handlebars. SharkMotorcycleAudio has designed this high-quality Bluetooth speaker to be used on any scooter, ATVs, boats, Jet Skis, motorcycles and golf carts etc to stream audio files wirelessly. It is provided with chrome bracket to install it easily on your motorcycle etc. It has 100 watt waterproof speakers to work perfectly on 10 volt current. Other features of these motorcycle speakers with built-in amp include LCD screen to show frequency of FM or song, 3.5mm Aux Input, SD and USB input, wired and wireless remote control system and FM radio. Source of input: You can choose from two types of input sources for your Bluetooth speakers. Either you can opt for the input source that needs to be connected to a portable device like iPod or MP3 or a head unit for input. You can also get the package of wireless speakers with head units in many cases. Water resistant or waterproof unit: Water resistant Bluetooth speakers allow you to enjoy the music of your choice even if it is slightly raining. But your speakers should be completely waterproof if you live in the area where heavy rainfall is a routine. Size of the speaker: Along with overall looks of the motorcycle Bluetooth speaker you should also focus on its thickness so that you can wear it on your helmet comfortably. Quality of sound: The Bluetooth speakers you choose for your motorcycle rides should be able to produce high quality sounds. You check the accuracy of sound yourself on the basis of your experience or hire a professional for this purpose. But you should Bluetooth speakers as per your preferences to listen to the types of songs. If you prefer to listen to hip-hop or rap music then your speakers should also be different from others. Wattage: The wattage of a motorcycle speaker makes much difference in the quality of its sound. Different speakers produce perfect sounds at different wattage. The wattage value of a speaker not only affects the volume of the sound but also its overall performance. The speakers with low wattage value are normally less powerful than the speakers with higher wattage values. The wattage of your Bluetooth speakers for your motorcycle depends mainly on the regions you mostly travel in. You may need loudest motorcycle speakers if you usually travel to noisy areas. After going through the tips and tricks of choosing the best wireless Bluetooth motorcycle speakers and reading the reviews of some of the best speakers it can be concluded easily that you can find a wireless speaker of your choice, to enjoy your favorite music while driving, by considering certain things carefully. 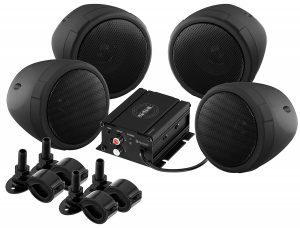 Self amplified motorcycle speakers can also be a good choice for you if you want to adjust the volume of their sound as per your requirement. In order to buy best motorcycle fairing speakers, you should compare the features of the five wireless motorcycle speakers discussed above. Though all of these speakers are the best in their class still they have some difference from each other. It will help you to take a right decision while purchasing one.